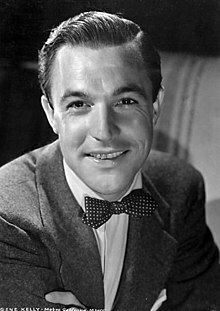 Eugene Curran Kelly (August 23, 1912 – February 2, 1996), better known as Gene Kelly, was an American dancer, actor, singer, director, producer and choreographer. He was a great example of 20th century filmed dance, famous for his energetic and athletic dancing style, his good looks and the likeable characters that he played on screen. Although he is probably most famous today for his act in Singin' in the Rain, he was the most popular actor in the Hollywood musical movie industry from the mid 1940s to the early 1980s. Kelly died of a stroke on February 2, 1996. This page was last changed on 14 January 2019, at 19:36.